In this day and age of tig welded bikes, lugs are mostly the domain of small custom builders like me. There are a few exceptions of course, but by and large modern lugged frames are made one-at-a-time and lots of effort is lavished on each one. Oddly enough, the variety of available ready-made lugs has never been greater, and the quality has never been higher- even though the big bike companies buy very few or none. So why make a lugset from scratch? Occasionally, the market doesn’t offer an off-the-shelf part with the correct dimensions, but that’s not the case with the bike I’m working on right now. The only other reason is simply for looks. Builders have always modified existing lugs to make them pleasing to the eye, and to set them apart from others. Certain builders developed their own unique shapes and styles, many of which can help identify an older bike, even if it has been stripped of decals and paint. Sometimes the customer wants the lugs on his or her frame to look a certain way and will offer me some loose guidelines- or sometimes they know exactly what they want. Other times I make them a particular way just to satisfy myself. Often I will create my own interpretation of a style or shape that someone else has done before. Let’s face it, it’s nearly impossible to do something in the bicycle world that’s truly new. Some think it’s silly to try and re-create the past, others think there is meaning in paying homage to those who might have provided inspiration, instruction, or encouragement. I know that the first time I saw this shape, I fell in love with it. Here are the beginnings of my take on a style used by many but that I first saw on an Alex Singer bicycle. 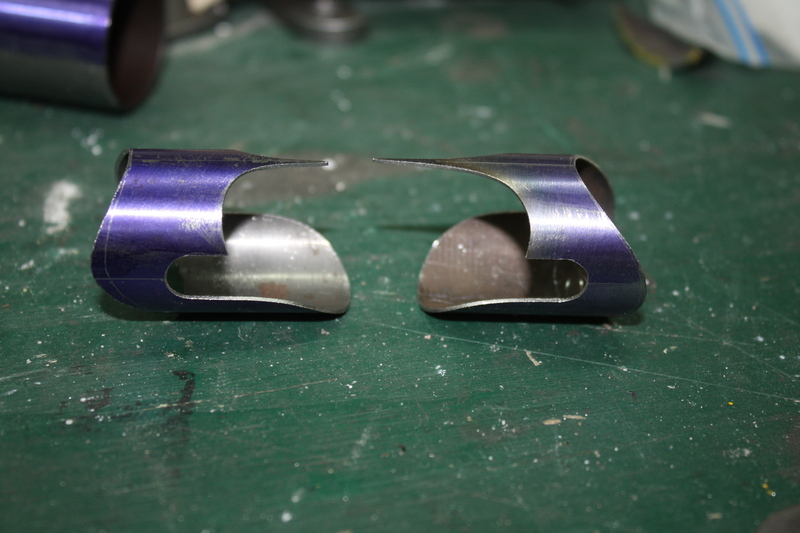 The piece on the left will become the top tube socket of the seat lug. The piece on the right is for the other end of the top tube and will be fillet brazed directly to the back of the head tube. A similar socket will be brazed on a few inches away for the down tube. This makes a unique looking one-piece head tube/head lug. This entry was posted on October 15, 2012 by Thompson Custom Bicycles. It was filed under Uncategorized .